One of the most needed, and incidentally most sparse things in any home is storage space. Yes, there is a wealth of common storage options for any room, and we’re sure you’re the proud owner of many of them, but somehow there’s always too little space to put away books, spare cushions or quilts, and assorted trinkets neatly. And stylishly. Let’s be honest – most traditional storage options, be it book shelves, armoires, or cupboards are practical and -at best- okay looking. Employing a bit of paint, some elbow-crease and a lot of talent for decoration, they might even be pushed into the ‘nice’ range. 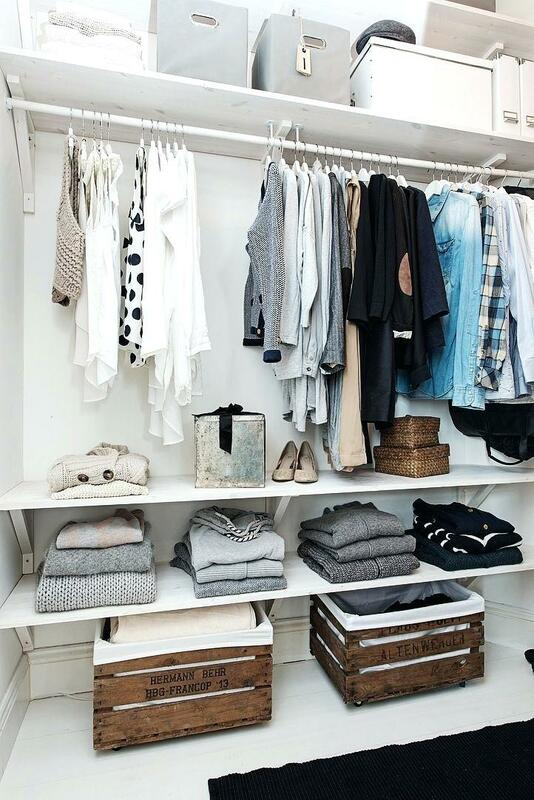 There are, however, storage ideas that are at the same time incredibly practical and very stylish! Wooden crates are a staple of most yard sales, and typically lead a very much under-appreciated life in basements, attics, and cramped storage rooms. But that’s by far not all they can! With a bit of creativity and a smidgeon of DIY-work, wooden crates are incredible storage options that are easy and cheap to get a hold of and will transform your home instantly. 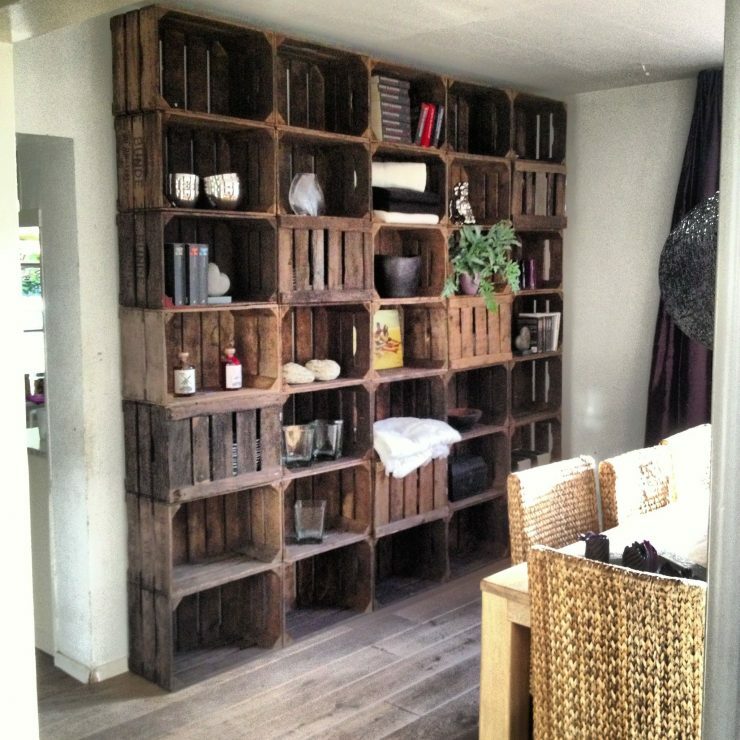 We have collected the best wooden crates storage ideas for you to help your creativity along. So grab a cup of coffee, sit back, and let yourself be inspired! Maybe one of the most obvious option, but still somewhat surprising. Stacking wooden crates along one wall to create a handy, rustic floor to ceiling shelving option that can hold anything from books to potted plants is a quick and easy way to expand your storage space by leaps and bounds in a matter of minutes. All you need for this storage ideas is a boy of nails or screws, a stack of wooden crates, and some time. 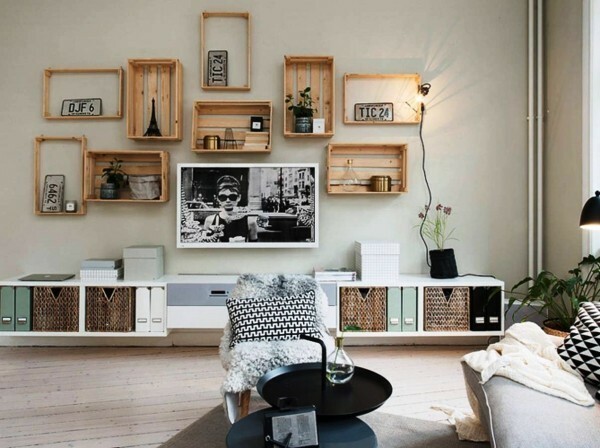 One of the easiest ways of recreating the stunning look of floating shelves is by simply screwing a handful of wooden crates to your wall. Stagger and rotate them for maximum effect, or use a bit of paint to add a bit of colour to the room or fit them to your design style. 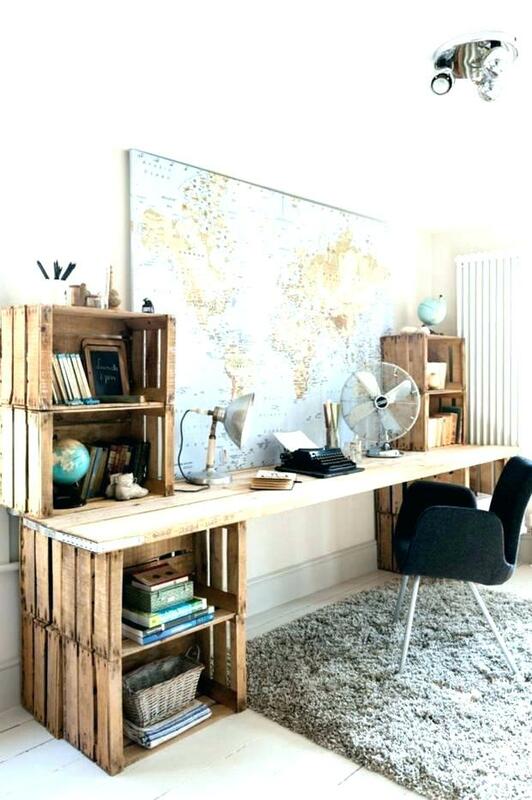 Kill two birds with one stone by using your wood crates to fashion a DIY desk with ample storage space. Simply put a wooden board (or other suitable surface for a table top) atop stacked wooden crates to create the base of the desk. Add some more crates to the desktop to create even more over-the-desk storage space and enjoy your new workspace! Fashion a small side table with ample storage space for essentials like magazines, newspapers, books, remotes, and maybe a snack or five by paining a wood crate in the colour of your choice. Add small rollers to your new coffee table to make it even more handy and versatile. 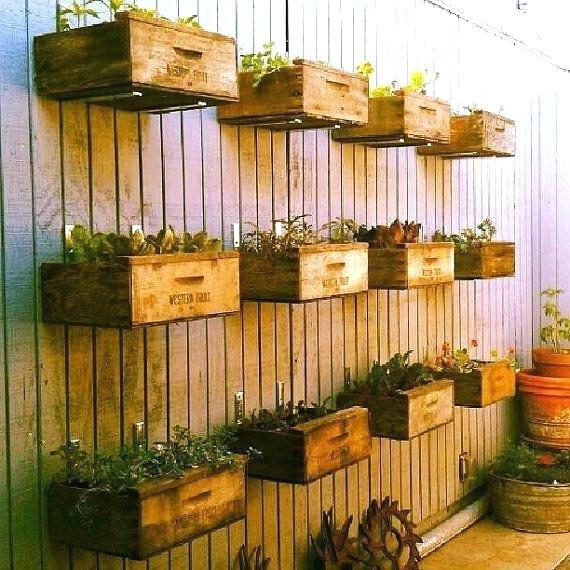 Use wood crates to easily create a trendy hanging (kitchen) garden to store your herbs or grow some flowers or veggies. Depending on the location of your small hanging garden and the available space, you might want to saw the original crates in half (which actually is a perfect way to save money while getting more individual mini-gardens, so no harm done!). With children in the house you’re always short on toy storage space – particularly after Christmases and birthdays. 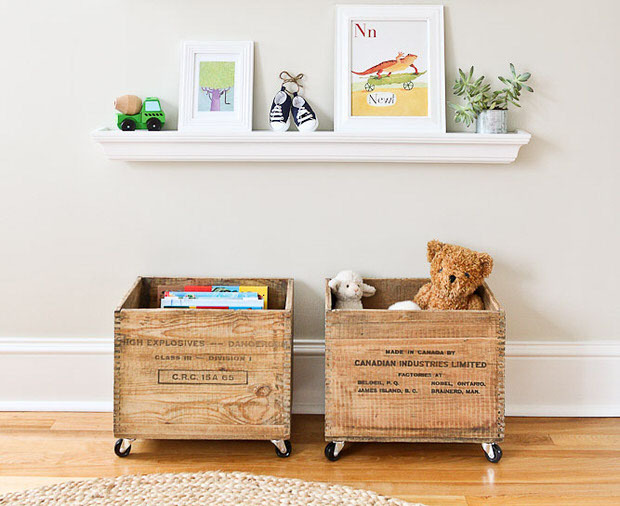 Fashion cute, well-sized toy storage crates by adding rollers to wooden crates. Add a touch of colour or fabric to make them more cheerful, or screw or glue on some handles or pieces of rope to make them easier to lug around for your kid. Just take care to go over the crates with fine-grained sand-paper before handing them over to your child in order to avoid splinters! 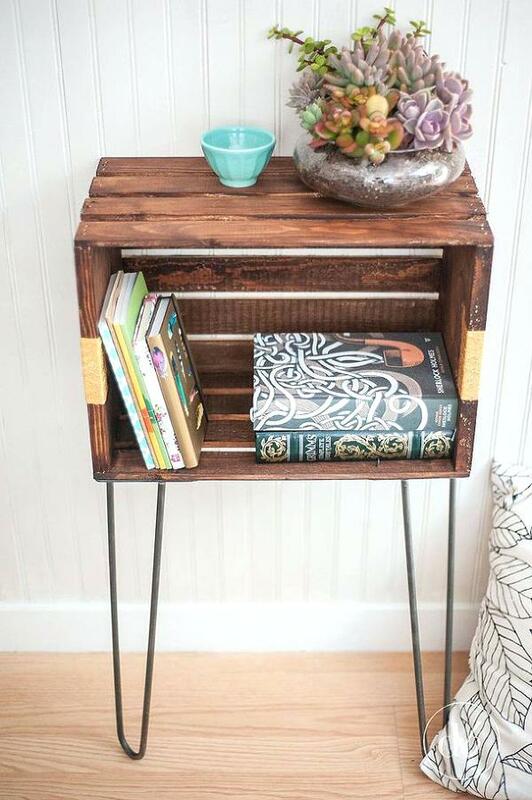 Even small tables and/or nightstands are easily fashioned out of spare wood crates! Simply add table legs to the crate and enjoy your new console table or nightstand with ample storage space for books, glasses, plants, and various knick-knack. In every wardrobe there are loose things flying around that should probably go in some box or drawer – if there was any space. Store accessories, summer/winter essentials, socks, scarves, or whatever else you want to put away safely but accessibly in handy wardrobe storage boxes. Add some lining to your wood crate to keep your clothes or accessories safe from snagging on the wood itself, and enjoy the newfound order in your wardrobe! 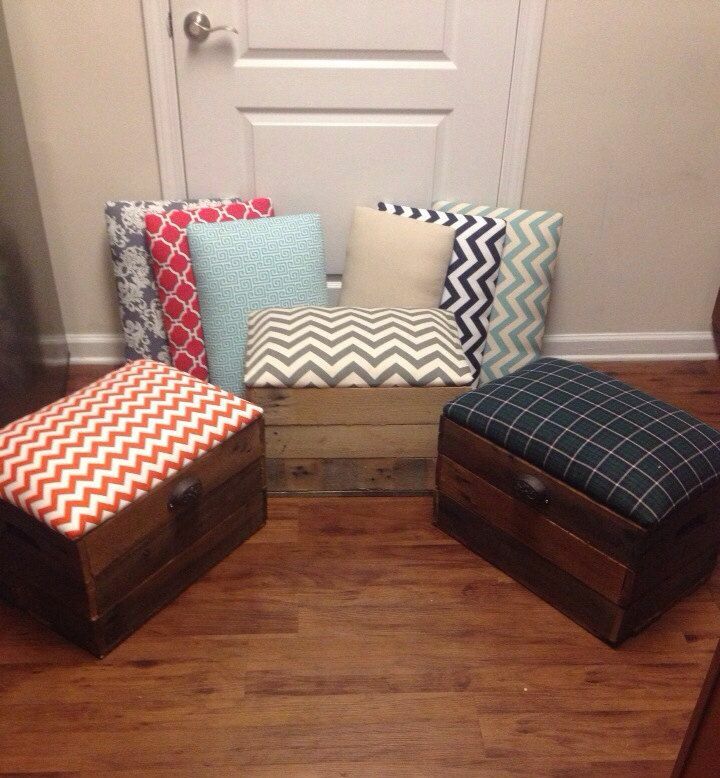 Combining (invisible) storage with additional seating space is always a win-win. Outfit sturdy wood crates with nicely cushioned lids and have the perfect space to store blankets, old magazines, or hide your emergency snack stash as well as a place to put your feet up or seat some friends. 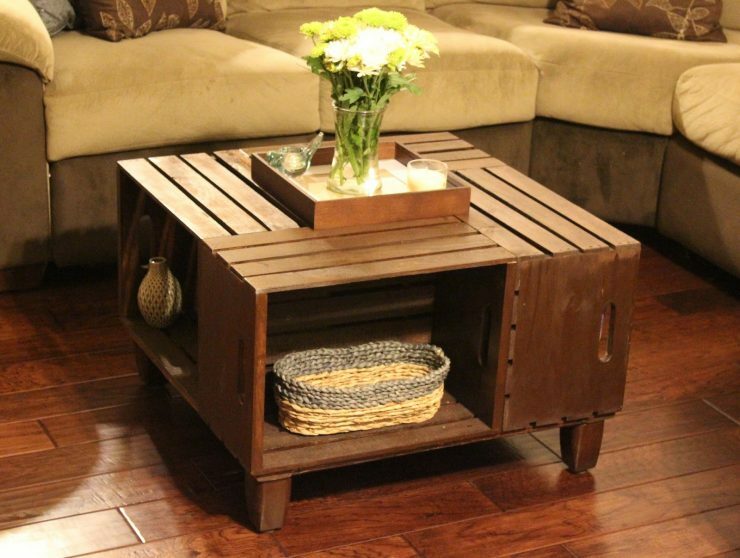 Fashion a good-sized coffee table with enough storage space to suit all your relaxation needs by combining four wood crates. Add sturdy legs for a more sophisticated look, or just place the whole construction on the floor for a more reduced style. Whether in your hallway, a mud room, or in front of your house, there’s always need for additional shoe racks. Particularly if you live in an area where wellingtons or high winter boots are a staple of your outfits, you probably know all about the trouble of finding shoe racks that fit those type of shoes. 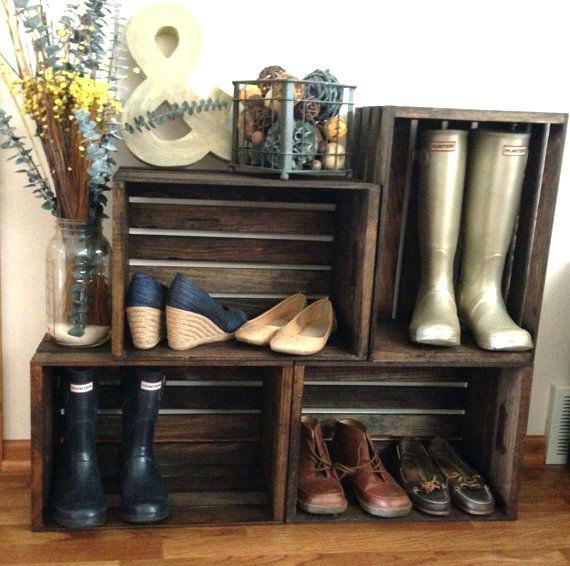 Combine wood crates with some standing up and others lying on their sides to create shoe storage that easily holds flats and trainers as well as wellies and over-knee boots. Ever asked yourself where to store those lovely, fluffy towels you just had to buy? Or where to hide those additional bottles of shampoo you got for an amazing bulk price? The answer to all your bathroom related storage questions are wooden crates! 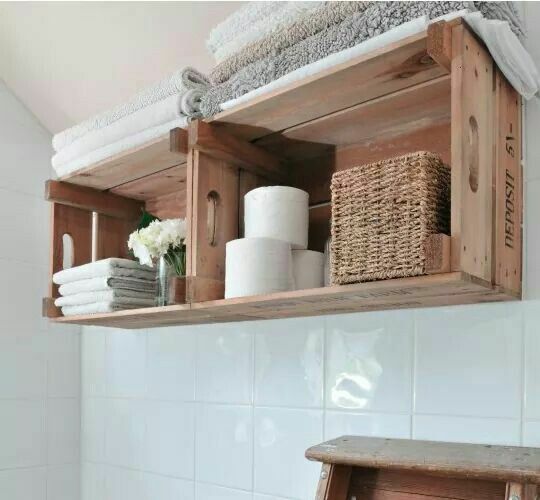 Their rustic appeal fit wonderfully in most bathrooms, their material is perfectly suited to withstand the damp atmosphere, and the storage space these easy DIY bathroom racks offer is simply incredibly! Use stacked wood crates to divide larger rooms and create comfortable nooks without having to cut back on storage space. 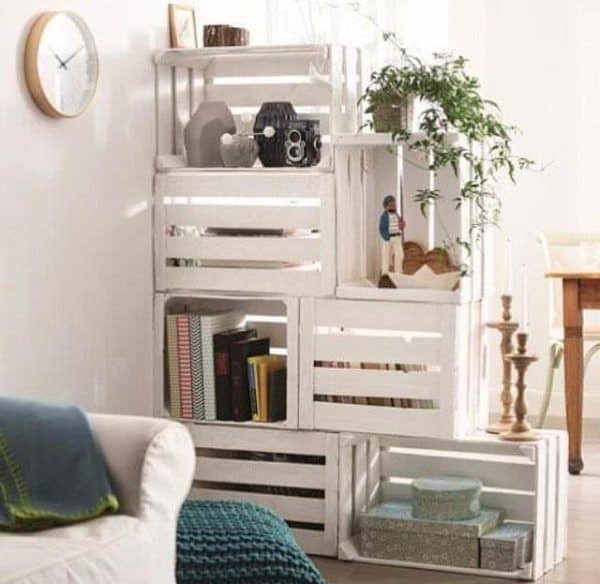 Paint the crates white (or in any other light colour that suits your colour scheme) to give the room an airy touch despite separating it into smaller sections! This easy way of fashioning a room divider is also a great way to offer a measure of privacy to bedrooms shared by siblings! 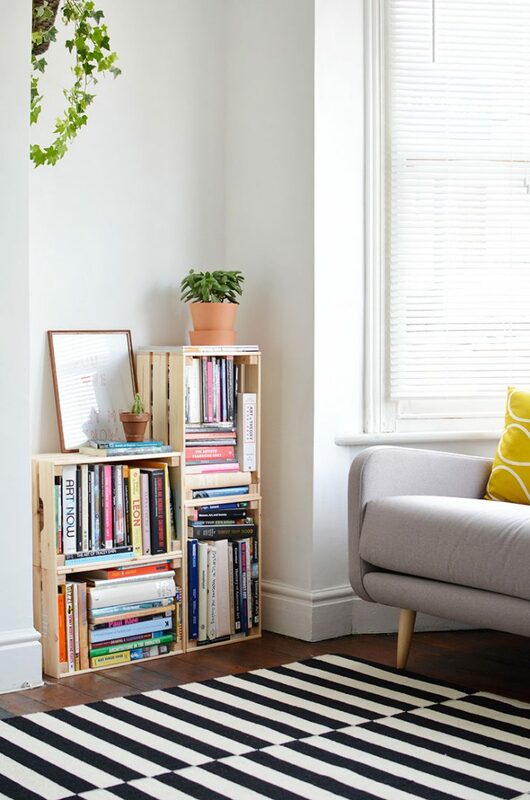 Make use of small nooks and crannies by filling them with small bookcases made of stacked wood crates. These storage racks also make great shelving for taller-than-average things like LPs.